Happy June everyone!! 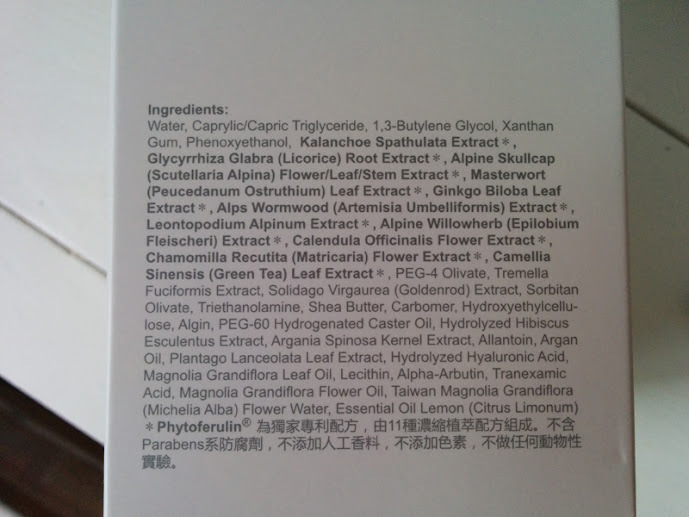 Here is another product review I think all you skincare junkies would enjoy! I wrote in my prepping for important events that I use face sheet masks in my process in prepping for important events. Since I have bought and been gifted a total of five Naruko products, I'm creating a Naruko Mini Series where I'll be reviewing all five products. If you're interested in seeing all the posts in the Naruko Mini Series, just search "Naruko" in the blog's search box! 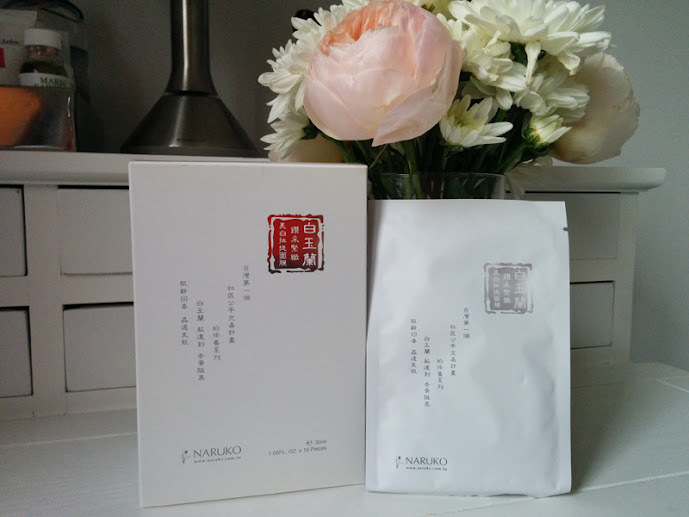 Today marks the first post in the mini series, and I'll be reviewing Naruko's Taiwan Magnolia sheet masks. Before the review, I just wanted to write a few quick things about Naruko as a brand first! Naruko is a fairly new and young Taiwanese skincare brand. It was made by Niu Er, one of Taiwan's most famous beauty experts. His philosophy behind the whole brand is providing natural and high quality skincare at affordable prices to all beauty enthusiasts. All of the products are preservative free. There are currently three total stores in the US - two in New York and one in California. After daily cleansing apply the mask aligning it evenly onto face and ears. Pull the bottom of the mask upwards and align it evenly under your chin. Wait 15-30 minutes then remove the mask; gently massage the serum until it is fully absorbed. Then continue with your skincare process. 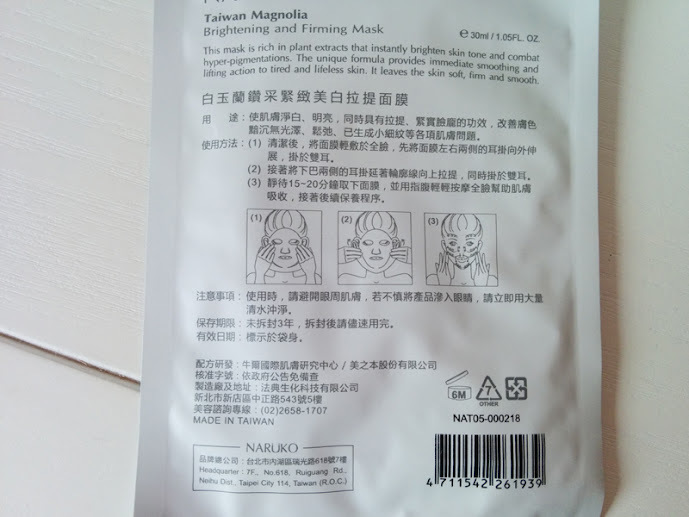 The back of the packet shows an illustration of how to put on the mask. The mask is packed with a milky like serum. When I first used this mask after my cousin gave me one of hers to try, I was surprised by how milky and opaque the serum was. I was really surprised that the mask had ear hooks. Yes, the mask had built in holes so that you can hook the mask onto your ears for a snug and tight fit. The scent of the mask is also very light and almost imperceptible unless you take a good deep whiff. Until Naruko, I've never used a sheet mask with ear hooks. I have a fairly small face as well, so a lot of other sheet masks are pretty large on my face but the ear hooks allow the mask to be an almost perfect fit - due to pulling the mask to the ears, it doesn't fit perfectly around the side of the nose since it's tighter than the average sheet mask. What's more though, the mask also targets your neck! There are 4 total ear hooks on the mask - two to keep the main body of the mask on, and two more on the bottom strips that hug the bottom of your chin and part of your neck. I leave the mask on for at least 30 minutes, but when I have the time I leave it on for 40-50 minutes. I usually can be productive and move around fairly normally because the ear hooks really keep the mask in place. After taking off the mask, I notice that my skin does look a tad whiter because my skin has been soaked in a white serum. However, even after my first use I knew that it is just a short term effect and it did wear off on 1-2 hours. Other effects include a smoother complexion, smaller pores, significantly softer skin to the touch, and of course moisturized skin. The mask is loaded with serum, so I usually try to salvage as much as I can from the package and put it back on the mask or on my arms & neck. You want a mask that fits well on your face. 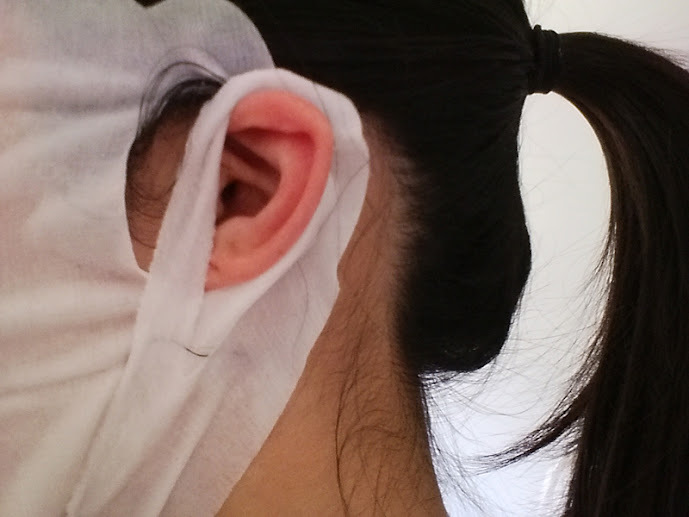 You want to try an affordable mask that has ear hooks. You want your mask to also moisturize your neck area. You want a short term whitening effect. 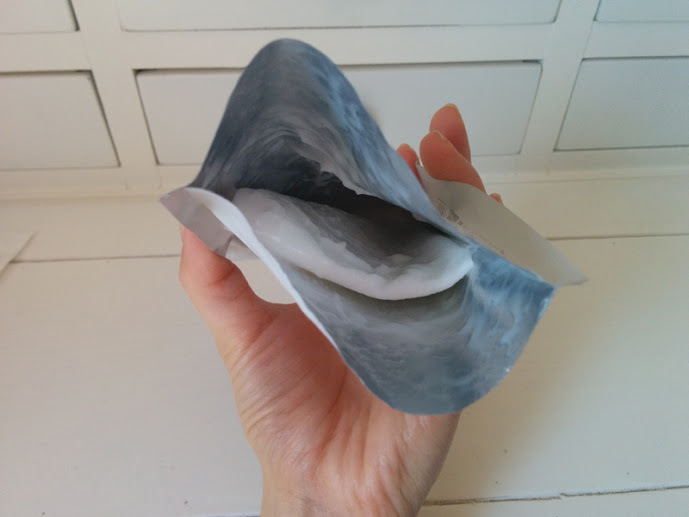 You don't want a whitening sheet mask. You want a mask to fight your acne and/or control your oil. 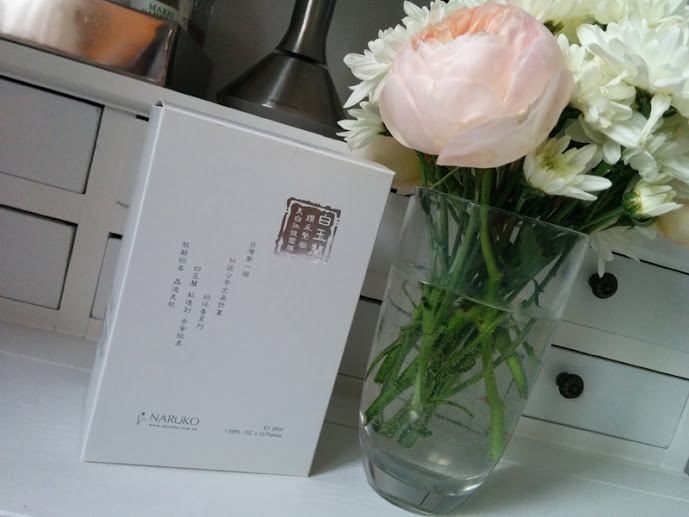 Although it's slightly more expensive than My Beauty Diary Face Masks, the Naruko Taiwan Magnolia mask when worn feels a step above My Beauty Diary Face Masks. The serum is thick, the mask fabric is thicker, and of course you get the ear hooks. However, I know that the Collagen Gold mask from My Beauty Diary also has ear hooks if you prefer their clearer serum. Naruko as a brand can be bought from their online ecommerce site, Amazon, and Sasa. If you can, try to buy from the official US boutique because they sometimes have amazing BOGO deals.